Is the forgotten war turning into a forgotten famine? What answers will we give when the next generation ask how we could watch these tragedies and do nothing? Still from the film documentary,’Starving Yemen’2016. BBC Arabic/BBC Our World. All rights reserved.Most of us are glued to our visual media watching the nightmare unfolding in Aleppo and the systematic bombing and killing of a besieged population in the city while the world’s politicians are debating allocation of responsibility in New York between meals at expensive restaurants. Meanwhile, as we are watching Syria, other tragedies are unfolding in the region, Libya and Iraq…. But I will focus on Yemen. For a year, the UN has been predicting famine in the war-torn country. Some of us have pointed out that Yemenis, unlike people elsewhere, don’t go out and starve to death in public. They have a different culture and do it at home and in private. Many of us wonder what answers we will give the next generation when they ask how we could sit and watch these tragedies and do nothing, just as we asked our parents how they allowed the Nazi holocaust to happen. And this time, there is no way we can answer that we don’t know. Why are we so helpless? Is there really nothing we can do? Just write, read, watch, turn up at demos in front of embassies and be ignored? Is that the best ‘democracy’ can offer? While many die at home some Yemenis, particularly children, do die in hospitals and their suffering is visible. Two journalists have just reminded us of this. On channel 4’s Unreported World, Yemen: Britain’s unseen war, Krishnan Guru-Murthy shows us harrowing scenes from hospitals in Sana’a and camps in the northern Tihama coastal plain near one of the war’s fronts. Nawal al Maghafi’s film Starving Yemen was filmed in Hodeida itself and in Beit al Faqih, 60 km south on a major asphalted straight road in the flat Tihama plain. The UN tell us that 14 million Yemenis are ‘food insecure’ and 7 million of them ‘severely food insecure’, in other words malnourished or starving. Both films were made about two months ago, and in areas relatively easy to reach. Since then the situation has only worsened. In both films, we see children dying of starvation and the diseases associated with malnutrition; they also explain the role of war-worsened poverty in the suffering. The children we see here have some access to medical facilities, despite the constraints on supplies and power, but they are still starving and dying. Both these films clearly demonstrate that famine is no longer a remote possibility for the future, but is happening now. Yemenis are dying of starvation now. What of all the children further afield? What about the adults? What about the millions who live in remote mountain villages and less remote towns in the hinterland, many days’ drive on collapsed tracks and across destroyed bridges, how do they get food? Highland staple is bread, and 90% of Yemen’s wheat is imported. Although the rains have been good this year and the sorghum, millet and maize crops should be good, they are by no means sufficient. Highland rural families at best satisfy 20 to 30% of their food needs from their own production, urban ones are totally dependent on purchased food. 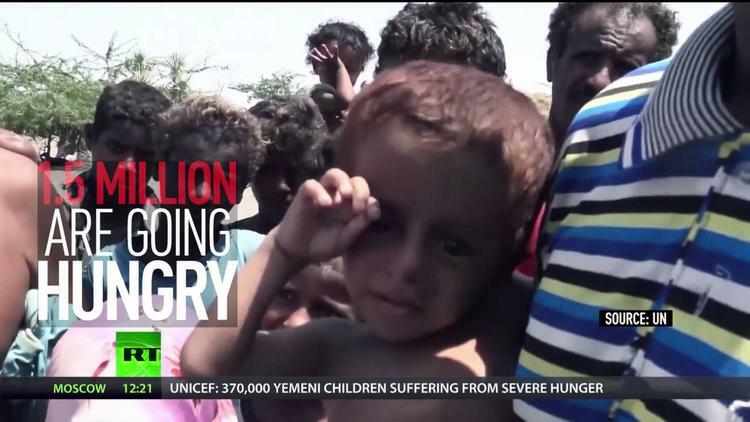 The UN tell us that 14 million Yemenis are ‘food insecure’ and 7 million of them ‘severely food insecure’, in other words malnourished or starving. This explains the shocking image in Murthy’s film of a warehouse full of 45,000 tons of decaying wheat flour which was unsuitable for human consumption by the time it was unloaded; it could have fed 45,000 people for a month. A further question: how come crucial crane cabins were so precisely and efficiently targeted when apparently incompetent targeting resulted in strikes on 5 MSF facilities, 4 of which are hospitals? Malnourished people are more vulnerable to all diseases. So the overall worsening of medical services is a further contributor to a death toll which, up to now, has been systematically under-estimated by the UN. Recently raised to over 10,000, as Dr Ashwak Muharram, the doctor in Starving Yemen says, “they only count those killed directly and ignore those who are killed for lack of medication, electricity in hospitals, or starvation. Do you have to be killed by an airstrike to count? What about the rest?” “Do you have to be killed by an airstrike to count? What about the rest?” Estimates of total deaths to those directly associated with military action vary widely, but the lowest figure is that as many people die of indirect causes. This would mean that the current death toll in Yemen would be over 20,000. Many observers, particularly those with experience of the medical situation, think this is a considerable under-estimate. There is little doubt that the medical services are unable to cope with the situation. First they are starved of supplies, whether medication, consumables, or equipment. Second most of them lack electricity as most public electricity networks are not functioning, many generators are destroyed, and fuel is expensive and hard to come by. Thirdly, damage and destruction of medical facilities has had a major impact. According to a World Health Organisation survey, published end of September, 274 health facilities have been physically damaged by the war, and as many as 1900 out of 3507 are either not functioning or only partially functioning. In 267 districts surveyed there is not a single doctor. In those hospitals which are functioning, the first services to reduce operations under stress are operating theatres and intensive care units: this almost certainly ensures that those with most acute and urgent problems will die. ‘Starving Yemen’, 2016. BBC Arabic/BBC Our World. All rights reserved. Importers of essential commodities have faced considerable difficulties on the international markets in recent months due to increasing constraints in the banking system and restrictions on letters of credit essential for large consignments. This situation is about to worsen dramatically because of the decision by the coalition-supported, internationally-recognised government to effectively paralyse the Central Bank (CBY). This was the only remaining and operating joint national institution in a country in practice divided between the area under the control of the Huthi-Saleh alliance and the areas surrounding them, which Hadi’s internationally recognised government claims to control. The CBY had remained neutral and been as well managed as it could be in the circumstances. Its reserves have melted in recent months due to a lack of income while it continued paying salaries. The Hadi government decided to ‘move’ the bank to its temporary capital Aden, and disavow the Bank’s governing body based in Sana’a, thus ending the truce prevailing on its functioning. This is the precursor to greater disaster for the people of Yemen. Taken with the approval of the new ‘Gang of four’, a group established on 25 August in Riyadh and composed of the US, Saudi Arabia, UAE and the UK, this decision will certainly cause much more suffering for the Yemeni people everywhere. Although the Gulf Cooperation Council states leading the coalition promise to support the new CBY based in Aden with substantial funds, observers are allowed to wonder whether and how promptly these promises will be kept; salaries of most military/security personnel in some parts of the ‘liberated’ areas are paid with very considerable delay. Both military and civil personnel on government payrolls are demonstrating daily demanding their salaries throughout Yemen, in areas controlled by both sides. The effective paralysing of the Central Bank will only worsen the humanitarian crisis, as it will make imports of food and medical supplies all the more difficult. It may even prevent remittances from reaching the thousands of families who are only kept above extreme poverty and starvation by the support they get from relatives out of Yemen. Meanwhile the war goes on. The usual fronts have seen more violent fighting since the breakdown of the peace negotiations in early August. The Saudi-led coalition air strikes have intensified. The military stalemate has certainly been a factor in the decision to end the truce on the Central Bank, a decision guaranteed to worsen suffering. The death toll mounts, from strikes, from malnutrition and starvation. The decision makers, whether Yemeni on both sides, or their supporters now focused on the new Gang of four, continue to show total contempt for Yemeni citizens’ lives and welfare. The Saudi-led coalition air strikes have intensified. At long last there seems to be some public momentum to put pressure on the British and US states to stop their sales of weapons and ammunition to the leading state in the coalition, Saudi Arabia. Opposition is growing. Both the British Parliament and the US Congress are witnessing moves to stop the arms sales; they have been unsuccessful up to now but at least they are showing concern. It is unlikely that our governments will prioritise the lives and welfare of millions of Yemenis over short-term profits for the arms trade from sales to Gulf Cooperation Council states, and the ‘jobs’ they provide. High tech jobs which could be re-cycled into more peaceful and useful sectors. Britain will see a Judicial Review of the government’s arms sales policy next January. Can we achieve more? Readers are urged to write to any officials of their choosing, demanding an end to the arms sales, demanding that their government call for a more even handed resolution at the United Nations Security Council which might make peace negotiations more likely to succeed, calling for an end to this pointless war. You can also help by informing as many people as you can of the situation, so Yemen stops being the ‘forgotten’ war. Donations to Medecins Sans Frontières or an alternative NGO of your choice active in Yemen will certainly be used to alleviate the suffering of a few people at least. Each of these small actions has a minimal impact, but if enough of us do enough of them, who knows? We may be able to answer our children that we put an end to some of the horrors of the second decade of this century. Yemen has a total of 333 districts. Thanks go to Nawal al Maghafi and BBC for permission to use the two stills from her film.